Australasia’s leading supplier of container solutions, Royal Wolf constructed the performance space from a converted shipping container for Brisbane’s famed Brunswick Street Mall to host an exciting variety of free music, dance, comedy, event activations and more. 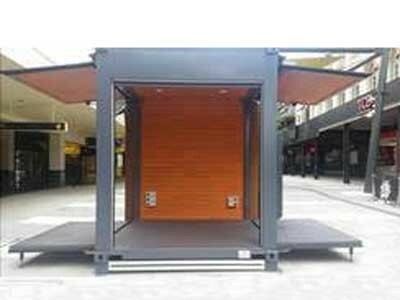 Designed in collaboration with the Brisbane Council, The Pod has been created from a 20-feet high cube container, which has been completely transformed to now feature an impressive fold-down stage, with the two awnings extending the platform by a metre on each side. The Pod also includes a secure storage area for key equipment and a brochure stand to act as a tourist information hub. Royal Wolf designed a functional yet impressive space available for commercial and community bookings. Royal Wolf’s expert modifications team sandblasted and painted the exterior of the container, installed electricity and lighting to illuminate the windows, and even added a back light behind the poster holders to promote events.